Venus has been dominating the early evening sky every night this year and continues to do so this month, becoming higher in the sky and seemingly brighter as the month progresses. It also starts to swerve away from Mars as it closes the gap between itself and Earth. As it moves between ourselves and the Sun, it becomes a thin crescent just like the waning Moon, but its brightness is unaffected. If you have a telescope, have a look; it is quite amazing (if you don’t, bribe someone who does to show you!). Anyway, while Venus is busy showing off low in the southwest, let’s have a look round the rest of February’s big sky. High in the south, once the sky is properly dark, is the beautiful cluster of the Pleiades, that little collection of bright, blue stars sitting in a wispy, thin cloud of gas and dust. 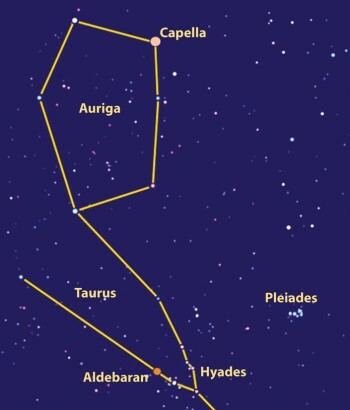 To the left and slightly lower is a big orange star, Aldebaran, the eye of Taurus the Bull. This is a big bruiser of a star, dominating this constellation and masking the thin cluster of stars that sit in the vee of bulls’s horns called the Hyades. In Greek mythology, these were the sisters of the Pleiades and were said to indicate the approach of rain. Higher still, in fact practically overhead, is another bright star. This is Capella, in the constellation of Auriga. He is the charioteer of the skies and he is holding in his hand a she-goat, represented by Capella. Please remember that the Ancient Greeks didn’t have television. Capella is another of those stars made up of several smaller ones – in this case a pair of giant Sun-like stars orbiting each other, around which orbits a pair of red dwarfs, also orbiting each other. It is possible that a planet could orbit this little ensemble but conditions might not be stable enough for life to evolve – or could it? Anyway that’s Capella, one of the brightest stars in the sky; go and take a look yourselves. Full Moon on the evening of the 10th of this month sees the Moon graze the shadow of the Earth, giving us a Penumbral eclipse. We won’t get the full blood-red Moon of a total eclipse but the Moon will darken, starting at about ten-thirty on the 10th and reaching a maximum about two hours later. Worth keeping an eye on maybe. If you’re out looking at the sky this late, you may even see Jupiter rise in the south-east in the company of another bright star, Spica. The month ends with another of those beautiful pairings of a thin crescent Moon and Venus, with Mars still close by. Look out for this one, it’s the last!